After your flight into Accra, Ghana, our experienced guides will meet with you at the Kotoka International airport, from where you will go to Hunters Lodge at Winneba (Windy Bay) Reserve. Here you will rest and acclimate for the rest of the day. In Kakum National Park over 250 confirmed species resides, including hornbill, african grey parrot and the white breasted guineafowl who is among 7 other species of global conservation concern. The first day in Kakum we will spend on the fabulous Canopy walk platforms, which we hope will make for a treat for even the most hardened birders. We leave for Mole National Park on day six. Mole National park is Ghanas largest wild life reserve, and harbours the country´s largest population of birds. Here you will not only see birds, but also elephants, antelopes, buffalos and many other animals. We will spend three days in Mole National Park to ensure that you will have plenty of opportunities to see as much of Ghanas wildlife as possible. 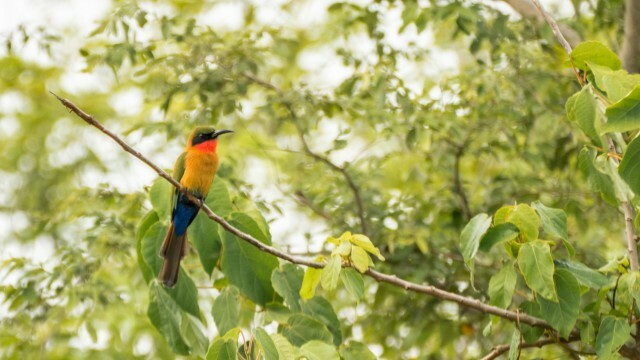 On our third and last day here in Mole National Park we will continue our birdwatching on the moist woodland, and try to see more of the vast number of bird species residing in the park. Here we stop for a day of relaxation. In Kumasi you will find the Kumasi Central Market, which is Ghanas largest traditional market, consisting of more than 10.000 stores. Here you will find every conceivable product in Kumasi. You will also be able to visit the Manhyia Palace Museum where you will get insight in the Ashanti history and will be able to see some key historical items pertaining to Ghana’s ancestry. Early morning birding at Atewa Range before your departure at the airport.